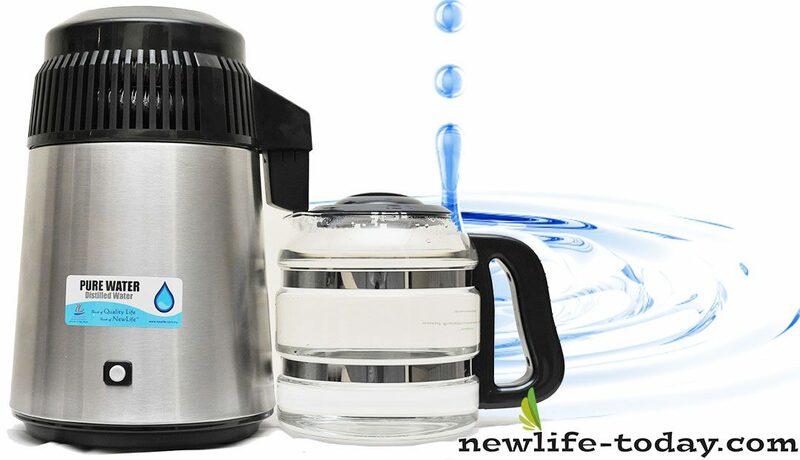 Buy this Pure Water Distiller (with glass bottle) at RM 1603.80 (20% off retail) when you become a member of NewLife International. Two-thirds of our bodies are mode up of water. Fluid travels within 60,000 miles of veins and arteries in each one of us. It lubricates our joints and soft tissues, while it fills all the cells and little hollows in our body. Since we lose water daily through excretion and perspiration, we have to drink or else we become dehydrated. Distilled water is water of the purest kind. It is water which has been turned into vapour, so that virtually all its impurities are left behind, then through condensation, it is turned back to pure water. It is odourless, colourless, and tasteless. Distillation follows nature’s hydrological cycle, which is nature’s way of purifying the earth’s water. The sun turns surface water into vapour. It rises, leaving impurities behind, then it cools in the atmosphere, returning to earth in a purified form such as rain. It is the single most effective method of water purification. It is God’s Water for the human race. Produces 4 litres in 6 hours at 580 watts. 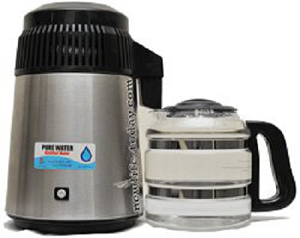 Produces water ideal for drinking, coffee, tea. soups, and baby formulas. Also ideal for steam iron and car batteries. No plumbing required. Portable and compact: net weight 3.52kg. Automatically shuts off when cycle is finished. 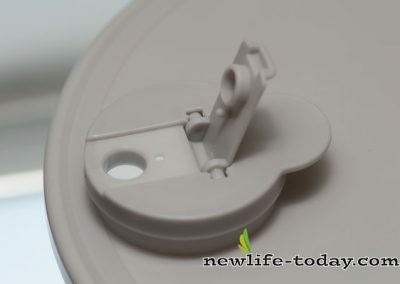 Comes with 122 cm detachable grounded cord. 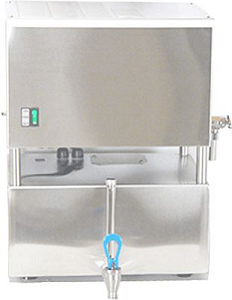 Ensures better water purity with stainless steel baffle, protective bottle cover cap. and organic carbon post filter. This Pure Water Distiller produces virtually pure water by using the oldest, most effective method of water treatment, steam distillation. 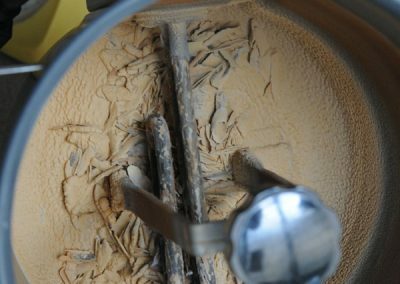 When the Pure Water Distiller is operating, the water temperature rises to 212°F (100°C), killing bacteria and viruses. 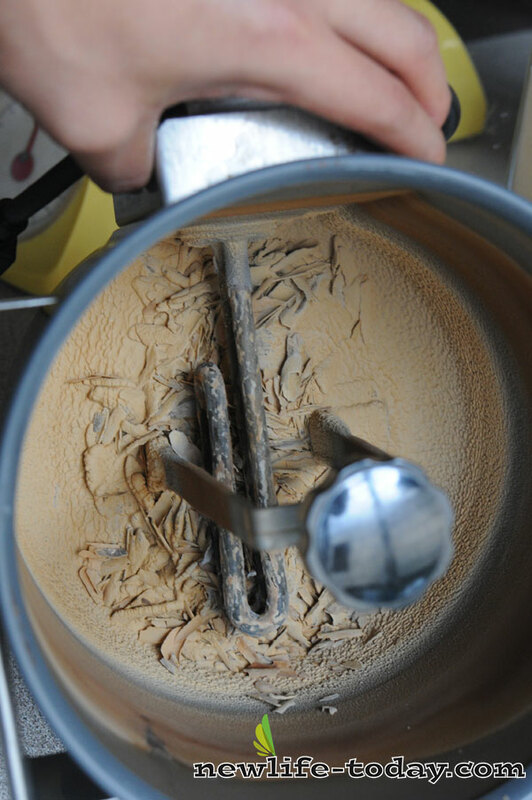 As the boiling water converts to steam, it rises and leaves behind inorganic minerals, sodium, and other substances. 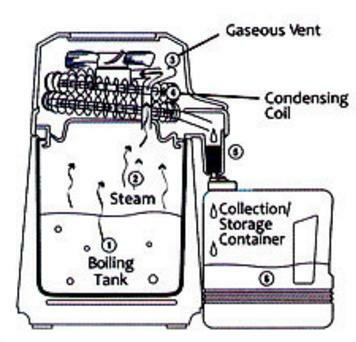 The light gases boil off and discharge through the gaseous vent in the condensing coil. Steam is then cooled in the stainless steel condenser, turning it into high-quality water. 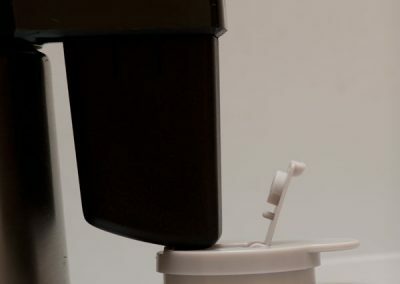 Distilled water passes through a final polishing activated charcoal filter to enhance quality by absorption of VOCs (volatile organic compounds), and is then collected in the polycarbonate collection/storage container provided. 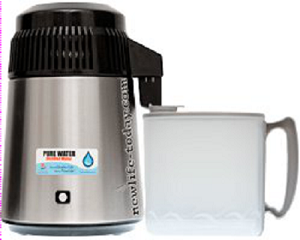 Pure Water Distiller is portable, simple to use and lasts very long with minimal maintenance. This unit comes with glass bottle. 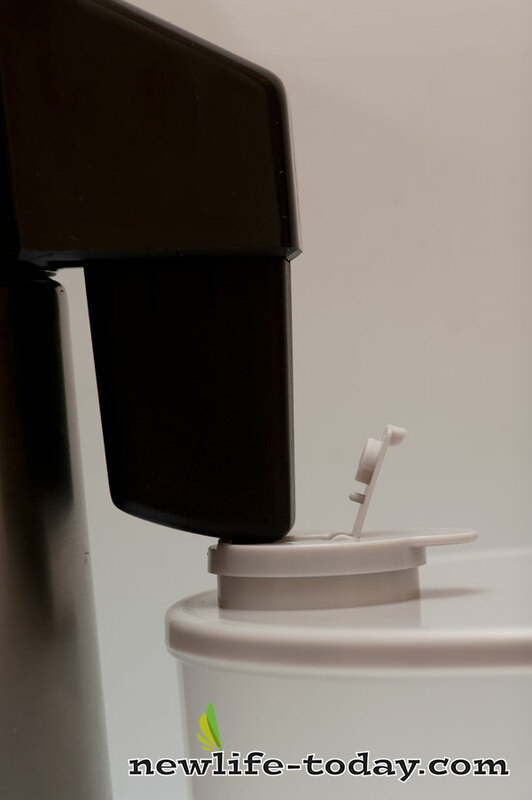 Durable under hot water and but more fragile than the PC bottle. Myth #1: Distilled water leaches organic minerals out from our bodies! This seems to be the most prevalent myth about distilled water. It’s ironic that one of the functions of water is to pick up minerals and deliver them to our cells or tissues. It’s rather absurd to fault distilled water because it does this better than contaminated water. The confusion on this seems to go back to a statement made years ago by Dr. Norman Walker that “Distilled water leaches out discarded unused minerals.” He was referring to the positive, cleansing effect of distilled water in removing unusable inorganic minerals, not a leaching of good, usable minerals. The only minerals distilled water leaches from the body are the inorganic minerals rejected by the cells and tissues of the body which, if not evacuated, could cause arterial obstructions, and even more damage. Myth #2: Drinking distilled water is dangerous! I’ve read that it is harmful because distilled water easily becomes acidic! Distilled water by itself is neutral. Whenever the air. that consists of oxygen, nitrogen, and carbon dioxide, dissolves in distilled water, the carbon dioxide forms carbonic acid. Without other salts in the water to buffer the weak carbonic acid, the pH value shows slight acidity. This is natural. The Water Quality Requirements of Quantitative Interpretations of USP (United States Pharmacopeia) which publishes standards for the pharmaceutical industry, including those for water quality was established by the U.S. Congress in 1884 to control the make-up of drugs. Their standards confirm that USP for Purified Water must have the pH in the range of 5.0-7.0. “For reasons I don’t understand, any number of myths — some quite extreme — have grown up over the years about distilled water. A quick Internet search today will take you to sites that put forth such views as ‘distilled water leads to early death.’ Nonsense. Myth #3: Ionized Alkaline water is better than Distilled water. When consumed, alkaline water helps to neutralize and flush out acid wastes. It has a negative oxygen reduction potential, or affinity, for the free radicals that attack cell tissues. It does not have to rely solely on supplemental anti-oxidants since your ionized alkaline water contains an abundant amount. “If you look at nature, all fruits (this includes even bananas, coconuts and durian) are acidic in nature, even though they are alkaline forming foods. Why did God make all fruits acidic? It is because they are exactly what the body needs. The body’s intestinal tract require an acidic medium. Have you ever thought about your stomach, how acidic it is? It’s acidity has a pH value as low as 2! Alkaline water neutralizes the stomach acids. Prolonged use of alkaline water may cause disturbances in the gastrointestinal tract, resulting in digestive and other intestinal disorders. The conclusion is that distilled water with a slight acidity is most suitable for our intestinal tracts. This is a statement used countless times, usually the literature from some filter companies trying to tell you that their filters take out all the bad contaminants and leave in the good, beneficial minerals. Fortunately, there are many reputable companies who would never think of making this kind of claim in its ads. Distillation will kill and remove bacteria, viruses, cysts, as well as heavy metals, radionuclides, organics, inorganics, and particulates. And yes. it will remove minerals, which fall under inorganic contaminants. The minerals in water are in an inorganic form. In other words, they are rocks. Our minerals need to come from food, not rocks. Through the process of photosynthesis plants are able to convert the inorganic mineral from the soil and its water into organic minerals. We were designed to eat plants to get our minerals. Myth #5: Distilled water is dead water. Not even fish could survive in distilled water! Of course, fish cannot live in distilled water. To survive, fish require plankton and other living organisms that need inorganic minerals to grow. Myth #6: Distilled water is too expensive, I can’t afford it! The total production cost of distilled water is RM0.40 per liter. Is it too expensive for you? Ask yourself some questions: How much is your average hand-phone cost per call? How much is a cigarette? Or how much is a can of 150ml soft drink? A distiller is an investment in your health that will save you money by preventing future diseases. I would rather someone spend money on getting a good water distillation system than to spend it for expensive surgeries due to cleaning out inorganic deposits in your arteries and veins.’ which is one of the main reason for “Arteriosclerosis” (hardening of the arteries).